You guys, I don’t even know where to start. These muffins need to be made. End of story. I’m a sucker for anything cornbread and blackberry, so recreating these at home was a no-brainer. While Bijou’s version was only slightly infused with cornmeal, I desired a heartier texture. So I did some experimenting, and what I got was gold: a cornbread muffin studded with juicy blackberries. Yum. These muffins turned out so delicious I can’t decide if they’re breakfast or dessert. They’d also make a great midday snack or side dish to savory meals like Tortilla Soup, Masala Tofu Scramble, and Mediterranean Baked Sweet Potatoes. If you try this recipe, let us know! Leave a comment and be sure to rate it. And don’t forget to tag a picture #minimalistbaker on Instagram! We’d love to see what you come up with. Cheers, friends! Simple, 1-Bowl Cornmeal Muffins studded with ripe blackberries. Tender, perfectly sweet, and a delicious snack or side dish to savory entrées. Prepare flax eggs in a large mixing bowl and let rest for 5 minutes. Also measure out almond milk in a liquid measuring cup and add apple cider vinegar and baking soda. Whisk to combine and set aside. To the flax egg, add maple syrup, organic cane sugar, and melted vegan butter (or oil) and whisk vigorously for 1 minute to dissolve sugar. Add applesauce and salt and whisk to combine. Then add almond milk mixture and whisk again to combine. Add almond meal, cornmeal and flour and whisk until just combined and no large lumps remain. The batter should be quite thick and scoopable. Add blackberries dusted with flour and gently fold into the batter. Scoop batter into muffin tins until almost full - there should the perfect amount for 10 (or 11) muffins (amount as original recipe is written // adjust if altering batch size). Bake on a center-positioned rack for 25-30 minutes (I found 26 minutes to be perfect) or until a toothpick inserted into the center comes out clean. Let cool for 15-20 minutes in the pan (to continue baking/firming up a little). Then loosen with a butter knife and gently lift out. Let cool completely on a plate or cooling rack. Will keep covered at room temperature for several days. Freeze for long-term storage (up to 1 month). *If gluten-free, sub the 1 cup all-purpose flour for 1/4 cup (27 g) more almond meal and 3/4 cup (120 g) gluten-free flour blend (or Bob's Red Mill Gluten Free 1:1 Baking Blend). The texture doesn't come out as crumbly and "cornbread like," but it's still really tasty! So much YES! I messed up a few ingredients and they still turned out AMAZING!! I can always count on you for easy, amazing and new ideas!! I used most of the ingredients, leaving out the rolled oats, shredded coconut, and adding a dash of cinnamon. They came out looking like the perfect muffin! I don’t have an Instagram so I wish I could share a photo here. I don’t know if that is something that could be added to this website, it would be fun! Could I use whole-wheat flour instead of all-purpose flour? Thank you! Yes! I’d suggest whole wheat pastry. It will affect the flavor overall, but will still work! let me know how it goes. Hello Dana, I’m a huge fan of your recipes! ❤️ I’m so glad that my boyfriend found your blog “ages” ago when you posted your spelt, oat pancakes. He made them for me on a Sunday. He can’t cook at all but they still turned out delicious. Today I made these for Brunch but since I’m drowning in apples this year I used a very sweet, pealed apple (diced) instead of the Berries. I put them in a pan with a little lemon juice, cinnamon and Garam Masala. I also added Ginger, Garam Masala and cinnamon in the batter. Next time I will also omit the sugar because my apples are so sweet. Instead of apple sauce I pealed and grated 1 1/2 apples. Hi Cosamea! Thank you for following along with our blog for so many years! Hi, I made these yesterday. Thanks for the recipe! I like that you put a lot of attention to details, so I feel I can trust what you write. I loved these muffins and will make them again, but my kids found they weren’t sweet enough. What would you recommend to add sweetness without messing with the balance between dry and wet ingredients? Hi Carlotta! Feel free to up the amount of maple syrup/agave nectar and that should yield a sweeter result! These are super delicious! I used Bob’s 1:1 GF baking flour, Bob’s medium grind cornmeal and a super ripe banana in place of applesauce. I had frozen Maine blueberries, so used those, but I think blackberries would be absolutely fantastic so I’ll keep my eye out at my CSA/farmshare for those. Someone suggested adding lemon zest. Such a great idea. I’ll try that next time too. These are definitely going to be repeated often! Many thanks! Hi! I really want to try making this…but I am allergic to tree nuts! Do you have any suggestions on substitutions? I’d suggest subbing the almond milk for anything other than almond (like coconut or rice), and subbing the almond MEAL for another meal, such as sunflower seed, OR oat flour! I LOVE this combo!! Genius! My only question is what would I trade the 1/2 cup of sugar for if I didn’t want to go that sweet? Thank you!! Feel free to omit the sugar if you prefer! I made these too and froze some leftovers. I microwaved one of the frozen ones for few seconds and surprisingly still good! I find it tastiest when warmed up…with my tea or coffee, of course! Thanks, Dana! Glad to hear it, Liza! Thank you for this recipe. These are so good!! I used medium stoneground cornmeal because that’s what we had, small wild blueberries because ditto, and subbed the almond milk with some too-runny homemade soy yogurt (a lot like buttermilk!). Great texture and taste. Will definitely make again! These muffins were AMAZING!!! I am usually one of those people that only eats the top of the muffin, but in this case the ENTIRE MUFFIN was eaten! So great! I also just 1:1 used the bobs red mill gf 1:1 flour and it came out fine! Also substituted blackberries for frozen blueberries, which added slightly more mushiness, but I don’t mind! Dana, I have made so many recipes from your blog, but this is one of my absolute favorites! These muffins are so flavorful, moist and delicious I can’t believe I haven’t been making them on a weekly basis. Especially now that blackberries are about to be in season, I see a lot of these in my future! The first time I made these they turned out amazing. Tried to recreate these a couple times since they were so good.. but the muffins are not baking fully. They end up gummy in the middle. Any idea what I could be doing wrong? I ran out of brown sugar. Is it possible to use turbinado sugar instead? I’ll definitely be making this again and again! Thanks for sharing your recipe changes, Audrey! I cant do apple sauce of bananas. How would I replace them? Canned pumpkin would be our next best recommendation! Made these today with raspberries instead of blackberries. Absolutely gorgeous! These muffins are delicious! 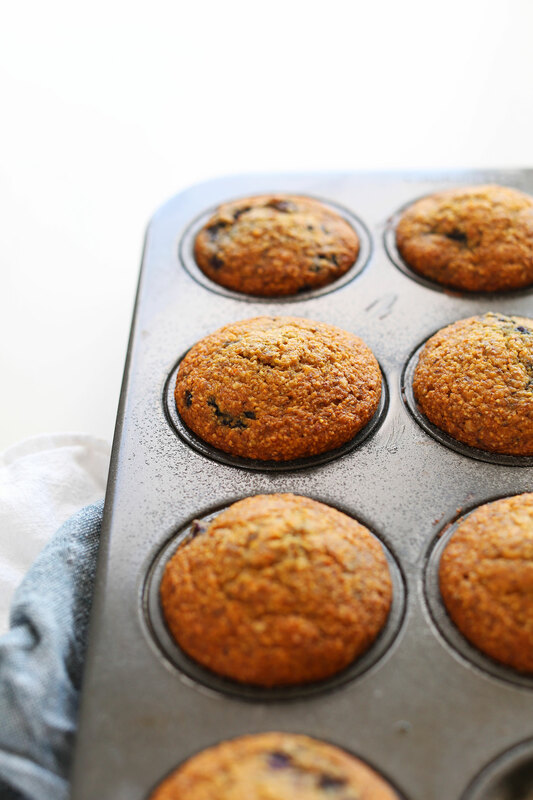 I’ve been looking for a healthier version of the cornbread blueberry muffin, and these are exactly what I was after (even using blackberries, which I prefer in baking. Why didn’t I think of that?) Grainy, hearty, and the perfect portable and filling snack for work. I didn’t have quite enough applesauce, so I used buttermilk to supplement it, soy milk instead of almond milk, and frozen blackberries. I also used brown sugar. I did about half of what was called for, since I really didn’t want these to be too sweet, but I think I could safely have used the full amount and been just fine. Still–I always like to cut back on sugar where I can, and these muffins were great without the full amount. These were amazing warm out of the oven and spread with a little butter, and I’m excited to freeze the rest and use them as work breakfasts on those days when I rush out the door without time for so much as a piece of toast. I’ll definitely be making these again! Hi! I love this recipe (and I add a whole jalapeno for some spice! ), but I put your recipe into MyFitnessPal and it calculated the calories for 1 of 12 muffins (mine usually makes 12) to be 450 calories. Should I go with your calculation? or theirs? Hello! I love the look of this recipe and can’t wait to try it. For those allergic to nuts, is there anything I can replace the almond meal with. Eagerly waiting your reply! Finally made these. Angry I waited so long because they are amazing. Thanks for the great recipe! I was SO excited to make these — and even more excited to eat them after they cooled. I used cherries, put in a tbsp of chia and 1.5 tbsp of ground flax, and threw in a few extra tbsp of applesauce to help offset the dryness of those two ingredients. I cut the sugar in half and also used vanilla almond milk, and I added cinnamon. Sorry, I have a tendency to go rogue on most recipes that give me a good base. But even with my rogue additions, these still turned out perfect! Thanks for a great recipe! Can maple syrup be used to replace the cane sugar? I would recommend coconut sugar as a substitute and have not tried maple syrup in place of cane sugar so I cannot say for sure! The conversion of maple syrup versus cane sugar in recipes can vary depending on the recipe, but typically one cup of white sugar can be replaced with 2/3 to ¾ cup of maple syrup. They turned out super delicious but the next time I would use more apple sauce bc they are a bit too dry still very great though my guess is that this happened bc of the millet flour. Please don’t get this wrong this is no critic. I love your recipes and I am so amazed by your ideas how to make vegan and gf recipes that actually are perfect for everyone. 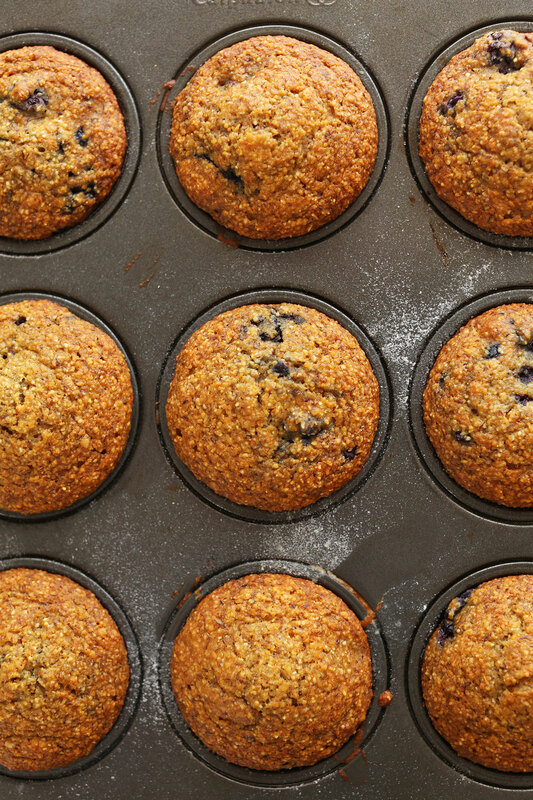 These are amazingly good muffins – taste like summer! I used white whole wheat flour (whole ground wheat from more delicate white wheat) and they were delicious! My husband loves cornbread too, so this is a winner. Any ideas on cutting back the sugar? Hi Sandra! Check the other comments as others experimented with this! You could either cut the sugar in half, or omit it completely. Report back on how it goes! I just made these and they are so good! The blackberries are the perfect ooey-gooey addition, no need for anything else on them. THese look amazing, but I can’t use almond meal. any Suggestions for a substitute? Thanks! Hi Elaine! Another nut or seed meal would work! I made these with raspberries, so good! Can this be made into a loaf? Thanks! I’m sure it can! Line with parchment paper and bake at same temp for 35-50 minutes! Let me know how it goes. but have 2 questions: first, I have on hand “stone ground corn flour” – will that give similar result to fine cornmeal or is it too fine/dense? Second, if I use buttermilk for one batch (half our family loves almond milk but half likes dairy) will I still need to add the vinegar/lemon? Can’t wait to see my teens grins when they come home to these warm from the oven! Hi Michelle, Corn flour is more fine than corn meal and will affect the consistency, but it might still work! Instead of using buttermilk could you substitute regular milk and still follow the recipe as is? Overall, we can’t guarantee the results with these changes but definitely let us know how it turns out! LOVED THESE and my picky kids did, too! We used local Maine blueberries instead of blackberries. SO delicious. Thank you for the vegan muffin recipes! I had such a hard time baking without eggs at first but your recipes always turn out perfect. THANK YOU! First tried the carrot apple muffins and now these blackberry cornmeal! Both absolutely wonderful! So thankful to be able to find vegan-friendly and amazing recipes! Thank you! These were absolutely delicious! I was out of almond meal, so I used oat flour instead (same amount) and they turned out wonderfully. I also used frozen blueberries instead of blackberries! Thanks for the lovely recipe! I made this yesterday after picking some berries nearby and they’re great! I had just read an article about resting GF pastry batter, so I decided to let the batter sit for 30 minutes prior to baking and they’re fabulous! I also added a few whole berries to the tops of each muffin for presentation. Thanks for another great recipe! These muffin were delicious! Thanks for the recipe. :) I sub the blackberries for frozen blueberries, they were great! I thought no muffin would ever top Minimalist Baker’s Banana Almond Meal Muffins (my absolute favourites!) but these are almost as good! I used olive oil instead of vegan butter, blueberries instead of blackberries and only 1/3 cup coconut sugar instead of 1/2 and they came out great! Thanks again Dana for all the great recipes! I think we should start a #minimalistbakercult! 5 stars! System wouldn’t let me choose them! Hello, this recipe looks wonderful! Is there something that I can sub for the almond meal? Thanks. Another nut or seed meal! What a fantastic recipe! I used strawberries and raisins since that’s what I had on hand. Additionally, I subbed blood orange infused olive oil for of the vegan butter. These turned out absolutely delicious and I definitely will be making them many more times with many different fruit combinations. Thank you! Just made these – they turned out awesome! My first vegan muffin. Made as above, but used avocado oil and cashew milk. Everything else the same. So moist and the texture was perfect. Will make again – and will try other berries, too! Just made these muffins…AMAZING! Actually EVERYTHING I have tried from your recipes have been AMAZING!!! Sauces, soups, tofu, salads, dressings, vegetables…!!!!! FANTASTIC!! Simple uncomplicated recipes that use ingredients I now know to have on hand for health and taste. YOU ROCK!!! THANK YOU!!! I just made these and wow…. I already ate 2 right out of the oven :O SO GOOD! I used Had to substitute a few things that weren’t on hand: ground flax seed for almond meal, buckwheat flour for all-purpose flour, lemon instead of apple cider vinegar and olive oil for vegan butter. But man were these a hit!! Also completely omitted the sugar because I don’t have a sweet tooth. I’ll definitely be making these again!! I used strawberries and whole wheat pastry flour – worked soo well!! These are awesome. I have been making them since you first blogged the recipe, but changing berries with whatever I have (mainly mullberries because I have a tree and free the berries for such uses.) My latest installment is a cranberry cornmeal muffin! Delicious and super festive for the fall/ Christmas flavors we all enjoy! These were fantastic! I made them first with blackberries because well why wouldn’t you. Then I made them without blackberries because now I have a cookbook dedicated to your recipes and I didn’t want to try another recipe but just wanted plain cornmeal muffins… yup still fantastic! Thank you for another amazing recipe. Yum! These look delicious, as usual. I can’t wait to try baking them! Blueberries and cornbread are a match made in heaven (second to chocolate, bananas, and PB of course). Thank you for sharing! I just made these and they turned out perfectly– they are divine! I cut the sugar in half, and added walnuts and cinnamon also– so many variations possible. Next I want to try pineapple and carrot with walnuts! Wonderful! thanks for sharing, Janet! I have these in the oven right now, and they smell like summer vacation at grandma’s house. Like bliss. I substituted one large egg for the flax eggs… hope they turn out okay! Thanks for your beautiful blog and recipes! I just made these muffins. Really great taste! I’m a real muffin person because I like to freeze them during the week. 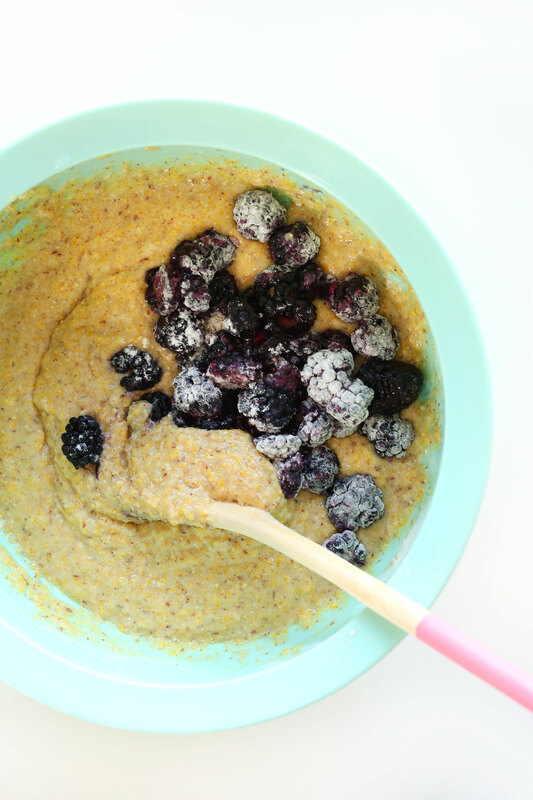 The combination of cornmeal and blackberries was really unusual for me. I’ll definitely make them again. Sadly, I’m allergic to almonds. Do you have any substitutes for the almond flour? I just made the gluten free version. I didn’t have applesauce so I used canned pumpkin instead and these are so damn good. I have yet to try a recipe I didn’t love from you. can i use frozen berries in this? Can you leave the batter in the fridge for a few days? I would like to just bake a few at a time rather than the full batch. I’d say two days max. Great! So glad you liked them, Mary. Late to the game, but these look AMAZING! Question: does the almond milk+vinegar+baking soda = a buttermilk substitute? I’ve used milk and lemon juice as a sub before, but never vinegar. I’m not vegan, so if so, I’d probably opt for buttermilk. Thanks!! Yes, it’s a buttermilk substitute. Just sub lemon juice! I omitted the cane sugar totally. I did use 2 regular eggs (ok, ok, I’m not really Vegan, just Clean Eater), and I substituted Coconut Oil for the oil used in the recipe. Also, in place of the all-purpose flour I used sprouted hard whole wheat flour. Mine turned out wonderfully, and they freeze very well. You could omit the salt! Some of the sodium comes from the vegan butter, which you could substitute with coconut oil. would your DIY gluten free flour work in this recipe? I tried it, and it was OK! Not as good as the all purpose. The flavor was still awesome! Mine ended up very crumbly, maybe because of the coconut flour? Anyway, I’ll definitely make them again! Can I use another 3/4 cup of butter for the applesauce? Or do you have a substitute suggestion? Hmm, I wouldn’t recommend that much. Perhaps just 1/4 cup more butter, then add 1/4 cup more almond milk? They turned out perfect! Thanks! These look and sound amazing, I will have to make these this weekend! 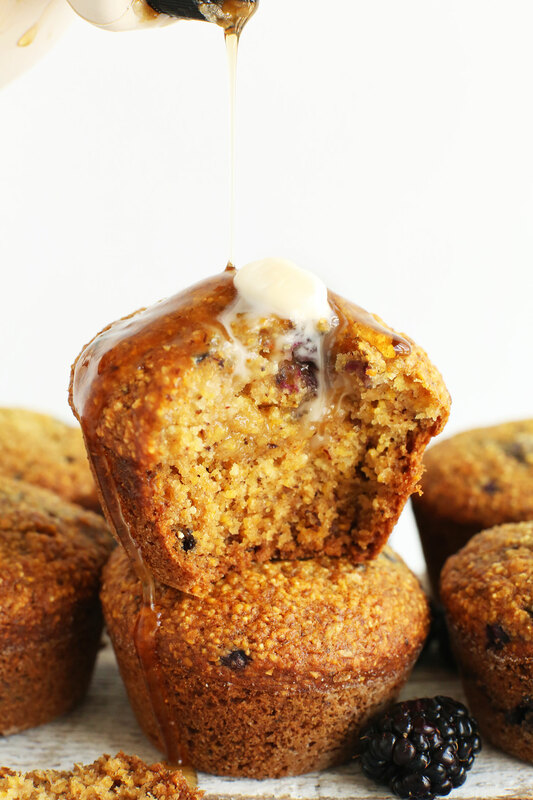 I love everything about these muffins- and I haven’t even tried them yet! I made these with 2 eggs, soy milk, and olive oil. I also subbed blueberries for the blackberries. They came out fantastic. Very moist and while they were sweet, they weren’t overly sweet. Just right. I think my muffin tin might be larger than standard though, because I only had enough batter for 6 muffins. They still baked fully in the same amount of time. Also, I prepped my muffin tin by spraying with coconut oil spray and they released very easily. Hi Dana – these muffins look amazing! I have one questions though: since I am intolerant to apples: can you recommend subs for the apple cider vinegar and applesauce? I was thinking lemon juice and more flour and more oil/butter? I tried them today with equal quantaties of lemon juice for the cider and similar amount of mashed sweet potatoe instead of the applesauce! Delisch!! mmmm these look fantastic. I love corn and cornmeal everything. Instead of the Gluten free flour blend I think I will try millet flour – it usually works great in gluten free baking! I can’t wait to make these! My favourite recipes are ones that are interchangeable between breakfast and dessert. I love the hearty texture of cornmeal and could clean out a whole tin of cornbread by myself! I didn’t realize you had a Portland guide and am so glad because I’m going in September and I can’t wait to eat my heart out! Oh awesome! Hope you love Portland, Genevieve! 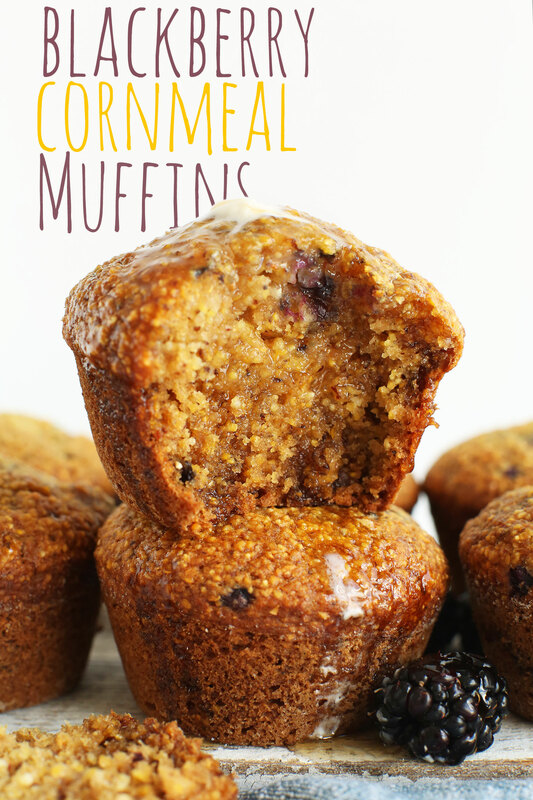 I’ve been wanting to make some cornmeal muffins, cakes, or anything really! I’ve never made it at home, but my grannie used to make a delicious one with fennel seeds that I was crazy about. I actually have some blackberries in my freezer, so might have to try my hand at making this! I think coarse ground will work, but let me know if you give it a try as I’m not sure! Just made these with 1/4 c coarse corn meal (polenta) for crunch and 3/4c fine, coconut oil and unsweetened vanilla almond milk (because that’s what I had). Loved. Blueberries would work great too, was tempted to substitute since we just went to a blueberry festival, but perhaps next time. Thanks for the fresh take on cornbread, went well with you sweet potato black bean chili. I can’t wait to make these muffins. The photo is incredible!! Mmmm-Mmmmm! Just ate one and frankly could probably scoff another 3 if I wasn’t thinking of my weight! Really moist, kind of sweet treat but not cloyingly sweet, went brilliantly with my mid-morning coffee (still warm – sorry I was too impatient to leave in the pan for 20 mins!). I did make one addition – (do you recipe inventors HATE this?!) – i had lovely organic lemons on my fruit bowl so I put in about 2 tsp zest too and if you love lemon/polenta you will find this adds the most heavenly lemony top note which is fab. You’re absolutely right, these need to be made! I love cornbread, and a low-carb version with blackberries sounds fabulous. This recipe was tremendous! Perfectly moist with just the right amount of sweetness so that I didn’t feel guiltily about adding honey on top when I gobbled down the first muffin, still warm from baking! Thank you!! Question: Can you sub 2 eggs in place of the flax eggs? Yes! One small chicken egg per flax egg. Let me know how it goes! Wow…these look incredible! I need to make these ASAP! Thanks for sharing such an awesome recipe! Is there any substitute for flaxseed eggs? Thanks! You could try a chia egg (same proportions, just sub chia seeds for flax seed). Or sub 1 small chicken egg per flax egg. Can I ask if I can use non fine cornmeal? You can, but it will affect the texture – more gritty. Let me know if you give it a try! These look SO good! I am definitely going to try them as haven’t cooked with cornmeal before, only savoury. What other fruit could I use? Am thinking apples but I see there is applesauce in the recipe already. Would rhubarb or raspberries work? I love your blog and the recipes, so simple and yummy! I’d say raspberries! Rhubarb would need a lot more sweetener. Can I use organic eggs instead? How many? Looks delicious!! Yes! 1 small chicken egg per flax egg. This is an incredible recipe and looks really simple as well! I have lots of blackberries in my garden so this comes at the right time. Unfortunately I don’t eat oil. Can I judt leave it out? I don’t know how or why but we are so frequently on the same wavelength food-wise! It is a little eerie…I just got back from the farmers market where I was hoping to get lots and lots of blackberries to experiment with making blackberry muffins. There were no blackberries :-( but I did load up on lots of other fruit. These look great. Corn + blackberries = yes! Looking forward to more spookiness. Yum! I am also corn free so what could I substitute? You could definitely try! I think it would work, it would just infuse more coconut flavor. Let me know if you do, Sarah! Hi Dana! These look wonderful, I just bought blackberries at the farmers market so it was perfect timing! Do you think I could sub whole wheat flour for the all purpose flour? Trying to avoid white flour. I do! I’d suggest whole wheat pastry. It will affect the flavor overall, but will still work! let me know how it goes. I made them with whole wheat flour and they turned out great! 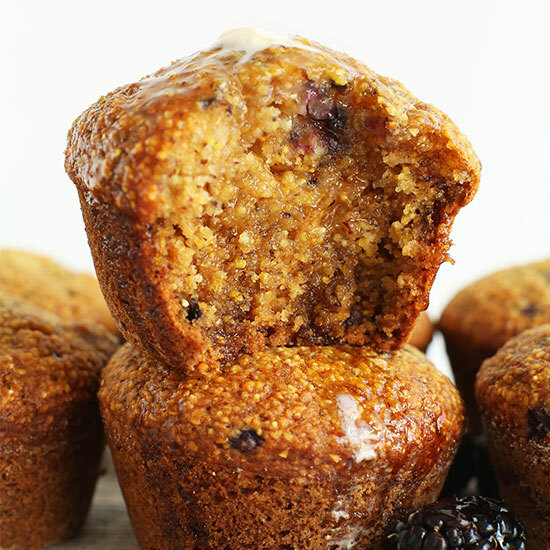 I’m crazy about cornmeal blueberry muffins, but I’ve never had the blackberry version- YUM! I love how grainy and wholesome they look. I’m definitely making these. Mmm a perfect summer muffin! I’m all over baking with cornmeal lately. Yum! Hi Dana! 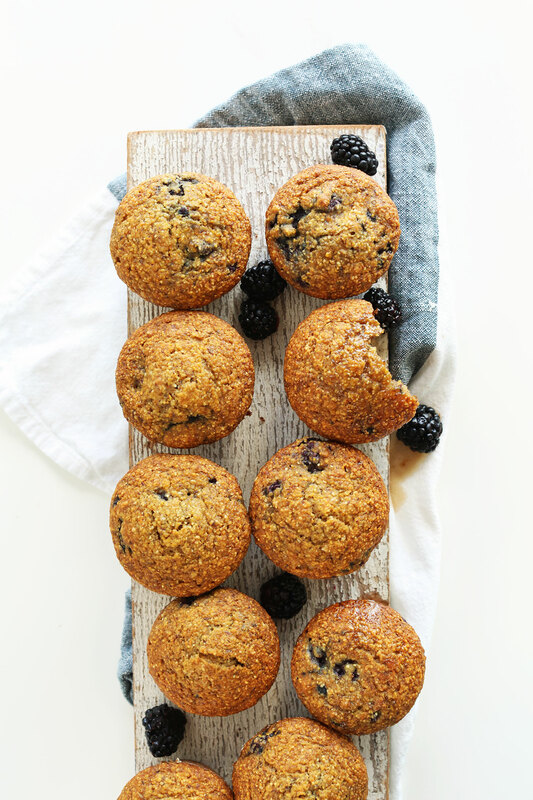 I can’t resist a healthy muffin in any combination, but corn and blueberries or blackberries are the best! I see you use flax eggs – I have to avoid eggs, so this recipe is perfect for me. I love cornmeal! These muffins are adorable and look so tasty! These look really yummy. I am truly a sucker for anything cornbread. I once made cornbread with EVOO out of necessity and the flavor was decidedly different, but sooo good. I couldn’t get enough. I’d definitely love to pair that whole jam with a lil’ bit of sweet. Do you know the muffin man. the muffin man. the muffin man. Sorry, I have young kids. These look beyond fantastic. Who doesn’t love blackberries? Or cornbread for that matter. We actually have a wild blackberry picking spot where we live where we pick for free. and get all scratched up but whatever.